Simply put, flours are finely ground grains, nuts, seeds, vegetables or legumes. 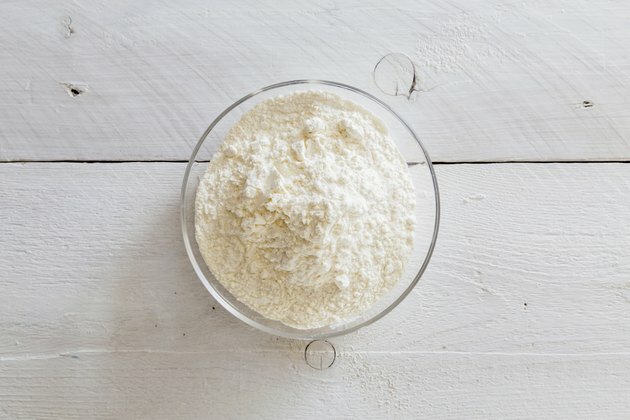 While some flours, such as soy, oat and almond, provide valuable amounts of nutrients, the process used to create refined flour can remove the most nutritious parts of the plant. When purchasing breads, cereals and other flour-based products, the American Heart Association recommends selecting varieties that list whole foods, such as whole wheat, brown rice or oats, as the main ingredient. A healthy diet, limited in refined flour, can lower your risk for potentially serious health problems. Because refined flour contains less protein and fiber than whole plant foods, such as whole grains, it's less filling and easier to overeat. In a study published in the "American Journal of Clinical Nutrition" in September 2010, researchers analyzed the dietary habits, abdominal circumference and abdominal fat levels of 2,834 adults. Participants who ate whole grains had significantly less abdominal fat than those who ate diets rich in refined grains. Maintaining normal levels of abdominal fat is important to maintain blood sugar control, cholesterol health and heart function. Most adults need 20 to 35 grams of fiber daily for overall health, yet Americans consume only 15 daily grams on average. A lack of fiber is the leading cause of constipation, according to the National Digestive Diseases Information Clearinghouse, which causes difficulty forming or passing stool, abdominal discomfort and painful bowel movements in 15 percent of people in the United States. A diet rich in refined flour products, which lack fiber, leaves little room for more nutritious, fiber-rich foods, raising your risk for constipation. While shredded whole-wheat cereal provides 4.5 grams of fiber per serving, a serving of refined cornflakes provides less than 1/2 gram. All flours such as wheat, barley or rye that contain the protein gluten cause intestinal damage in people with celiac disease. If you have the disease, even ostensibly gluten-free flour, such as oat, can cause problems if it was processed in machinery used to process wheat products, according to Rachel Begun, a registered dietitian and spokesperson for the Academy of Nutrition and Dietetics. If you have a medical reason for avoiding gluten, choose flours clearly labeled "gluten-free," or replace flour products with naturally gluten-free carbohydrate sources, such as potatoes and brown rice. Unlike fiber-rich foods, such as whole grains and legumes, refined flour can offset your blood sugar control, raising your risk for Type 2 diabetes over time. In a study published in "Annals of Epidemiology" in June 2013, the diets of 72,215 post-menopausal women without diabetes were analyzed for about eight years. Researchers found that women who consumed whole grains were significantly less likely to develop Type 2 diabetes than women who consumed diets rich in refined grains. For potentially similar benefits, eat primarily whole foods and limit processed foods that list enriched, refined or wheat flour -- as opposed to whole-wheat flour -- as the top ingredient.